Celebrate the beauty of the natural world with the Marini Ferlazzo wildlife collection by Maxwell & Williams. 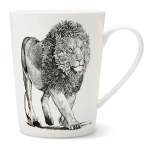 Each generously sized mug features a hand-drawn wildlife portrait by Melbourne artist Nathan Ferlazzo. Each mug includes a unique floral illustration that represents the animals habitat.